NIELIT will post the results to all the candidates on their correspondence. Along with, it will also upload the result on its student portal. After the declaration of result, candidates qualifying the exam can apply for issue of certificate. Only those candidates will be considered pass who will secure minimum 50% marks in practical and theory exam separately. 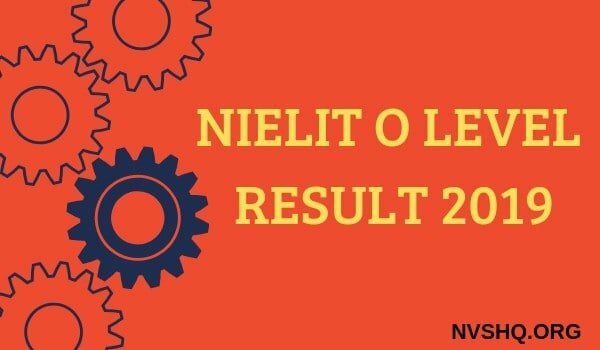 2 How to check NIELIT O Level Result 2019? The direct links to check result will also be shared in this page once the result will be out. Candidates can also check their result here on this page without any difficulty. To get more details on NIELIT A, B, C, and O level exam result, candidates can go through the complete article shared below. The result for NIELIT O, A, B and C level January examinations is about to release in few days. The result will be dispatched through speed posts to the postal addresses of the candidates provided at the time of online application. However, for the convenience of the candidates, institute will also publish the result on its student postal. Candidates can check their result from NIELIT student portal by using the login details such as registration no., candidates name, DOB, exam year, name, etc. The result is prepared on the basis of marks obtained by the candidates in theory and practical exam both. In order to pass the exam candidates must secure at least 50% marks in each theory and practical exam. The NIELIT result will show the performance of the candidates in the form of grades. Marks obtained by the candidates will not be mentioned in the result sheet. The marks are converted into grades and made available for the candidates through the official website. How to check NIELIT O Level Result 2019? Visit NIELIT student portal https://student.nielit.gov.in. On the homepage of the web portal, click on “View Result” option given on the right side. Select O level, A, B or C level option under the heading “Information Technology”. Enter exam year, exam name, registration number/candidate name/roll number, date of birth and captcha code. Download or take printout of the result for future reference. After the release of result, candidates will be eligible to get certificate from NIELIT. To obtain the mark sheet and provisional certificate, candidates can send a request to [email protected] and 011-25308392. They must mention their complete registration number and correspondence along with the request. The result will indicate the grades obtained by the candidates. Along with publication of result on official site, it will also be send to postal addresses of the candidates through speed post. Candidates whose result will not in favor can apply again for this particular exam. For any kind of grievance related to NIELIT result, certificate, marksheet, etc., candidates advised to contact the NIELIT controller of Examination. The complete contact information is shared below. If you face any problem in finding scorecard and certificate, then comment below your problem and our team will help you solve it. All the best for NIELIT O, A, B, C Level Result 2019. Sir O level , January 2019 ka result kb aayega ???? Is month me aa jaiga. Sir when O level result will declare of Jan 2019? Aane hi vala h. Wait kariye thoda.